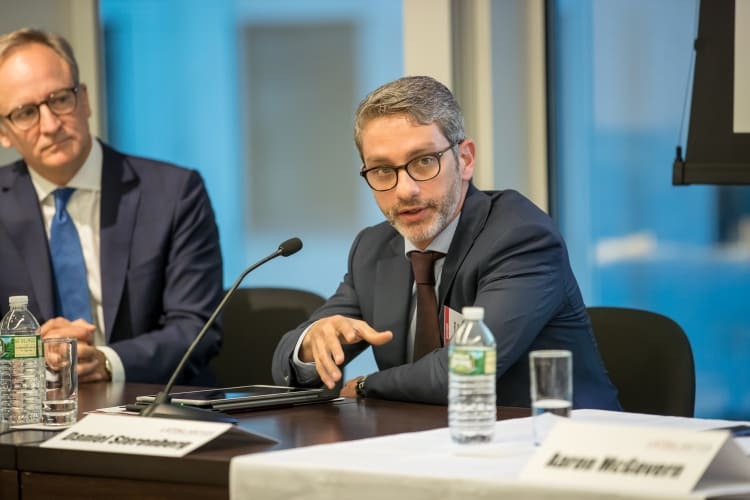 Despite being buffeted by corruption scandals and slowing economies, Latin America has seen a recent influx in long-term and sector-focused investors, heard delegates at Latin Lawyer’s 8th Annual Private Equity Conference, held in New York on Friday. LAVCA president Cate Ambrose said she sees increased fundraising activity to increase this year after a quiet 2016. While fundraising is still making a recovery, deal value in the private equity space has been high, with funds taking advantage of favourable exchange rates, she added. Speakers from private equity funds confirmed this sentiment. Daniel Sterenberg, managing director of The Carlyle Group, said: “Since 2015, we have been very active across the region. Despite the fall in commodity prices, the Andean region has kept growing and is quite stable macroeconomically. With Brazil, we believe we are leaving the bottom of the market,” he said. Aaron McGovern, investment director at IFM Investors, pointed to the amount his fund has pumped into Mexico as an indicator of the region’s continued appeal. “As a global fund, Latin America competes with every other region for our money. It is telling that we have put billions into Mexico alone,” he said. A notable development has been an influx of funds that focus on long-term investments, such as pension funds and sovereign wealth funds, and sector-specific outfits that are mostly targeting the energy, tech, retail, real estate and agribusiness sectors, said Ambrose. She cited one Canadian teachers’ pension fund opening in Brazil in 2014 as a sign of a vote of confidence in the country. Healthcare and education are two sectors that are consistently attracting all kinds of private equity funds, she added. There has also been a strong return for Latin America’s capital markets, with Brazil leading the surge on the equity side, and Argentina the debt side, said Rubin. He described Argentina’s issuance of a dollar-denominated 100-year bond as “mesmerising”. The country was previously locked out of the international capital markets for over a decade because of a dispute with its debtholders. Meanwhile, Brazil has seen a number of companies going public this year after a three-year drought. M&A activity is another area that has begun making a recovery in the latter half of 2017, after it sharply dipped in 2016 in part due to uncertainty following the election of US President Donald Trump, heard delegates. “There has been a pick up recently because people feel they can’t wait for Trump’s policies to crystallise and need to get on with business,” said Rubin. The environment for private equity has improved most dramatically for Argentina, albeit from a low base, said LAVCA’s Ambrose. For The Carlyle Group’s Sterenberg, however, the country still presents too much of a risk. “We still can’t be confident that the situation will still stable in five to seven years’ time. We will hold off on Argentina for now,” he said. Brazil, long a leader in accommodating private equity investments alongside Chile, has seen a slight dip in its appeal because of changes to rules governing institutional investors, said Ambrose. But the recovery is threatened by rising government deficits, upcoming elections in the region, increasing geopolitical risks and an expected rise in US interest rates. Rubin says that there are widely different expectations for how far the US federal reserve will raise interest rates, fuelling further uncertainty. Panellists from private equity funds also discussed what they look for in legal advisors. IFM Investors’ McGovern said having good relations with opposing counsel and other players is key. “We participated in a tender offer, and there isn’t a lot of precedent, so in that case it was important that counsel had good relations with the stock exchange and the securities regulator,” he said. For Sterenburg, legal advisors need to be able to keep a cool head. “Private equity investments can get emotional, so it is good to have someone that can keep their distance,” he said. This was echoed by Simpson Thacher & Bartlett LLP's Todd Crider, who chaired the event and moderated the opening panel. “One thing you learn as you get older is perspective,” he said. Francisco Ugarte of Chile’s Carey chaired the conference alongside Crider. Latin Lawyer will continue to report on the private equity conference in the daily news briefing.